There’s not much that I consider to be an absolute travel must-have. When it really comes down to it, all you really need is what’s in your pockets: your passport, some cards, some cash, and your phone/camera. Everything after that just adds to your comfort and experience. I prefer to pack fairly light. Any trip that I can do out of a carry-on makes me very happy, since I don’t need to worry about extra fees, or my bags being lost or damaged, and I can save a lot of time getting to/from my flight. 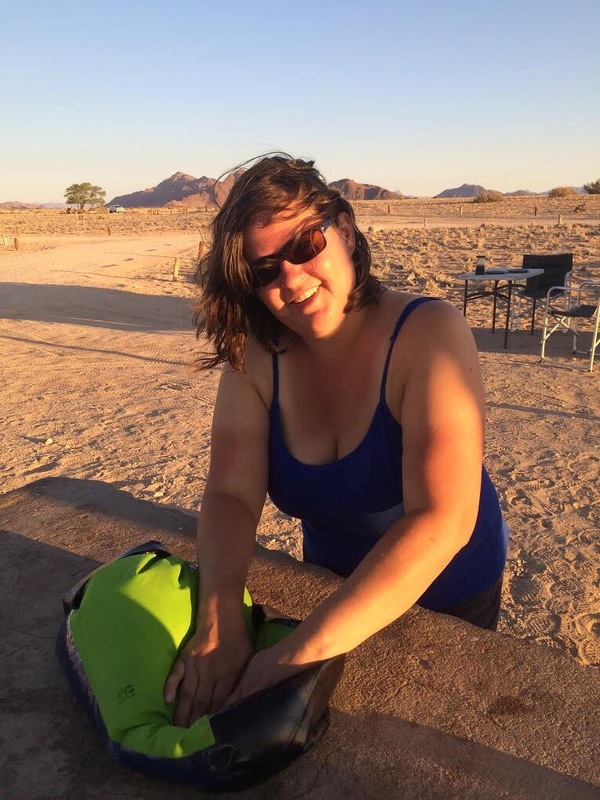 So, when I discovered a product that could help me save time and money, I decided to give it a whirl and see if it was worthy of inclusion on my packing list. TL;DR It is most definitely worthy! The trouble with packing light, is that you then have to make a minimal amount of clothes survive in a wearable condition for your whole trip. I like smelling good, actively adventuring, enjoying street food, and fresh undies. These preferences mean that I need to either pack more clothes for my inevitable spills and stinks, or I need to wash my clothes as I go. 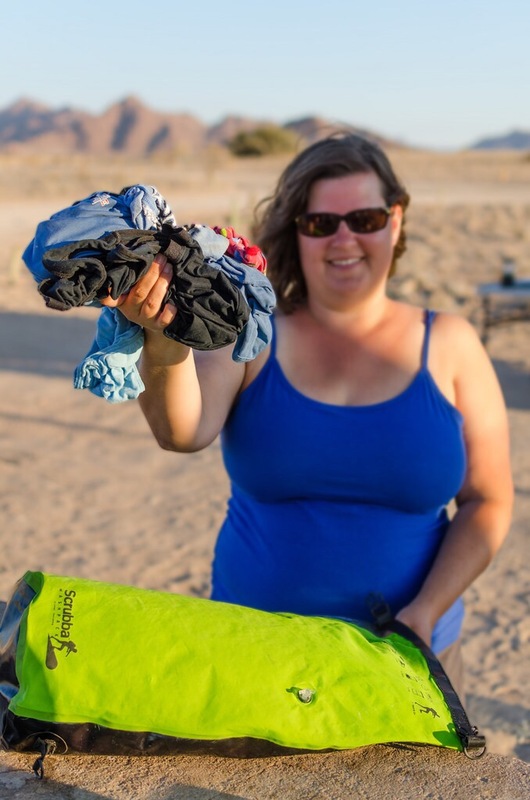 Washing clothes while travelling can present a number of challenges. It often means that I need to plan in an extra day at a hotel that offers laundry service, just so that I can be sure to have enough time to get the laundry order in before the cut-off time, and make sure it will be washed and returned/picked up before I leave for another town. I need to plan these days carefully, so that “prime dirty clothes time” matches up with “being somewhere that laundry can be done in time time”. I plan my outfits so that what I want to wear in week 2 can be worn and safely washed in week 1. When I say that I worry about what can be safely washed, I mean that not all laundry services are created equal, and neither are my clothes. I am what you’d call an inbetweener. I am at the tail-end of regular store sizing, and maybe just fitting into some plus-sized outfits. Generally, it means that finding clothes that fit well is supremely difficult (especially in foreign markets) and there is absolutely no room for shrinkage. I don’t put most of my clothes in the dryer. The trouble is, I’ve yet to encounter a laundry service where you can request they just wash your clothes and then leave them to hang dry in your room. 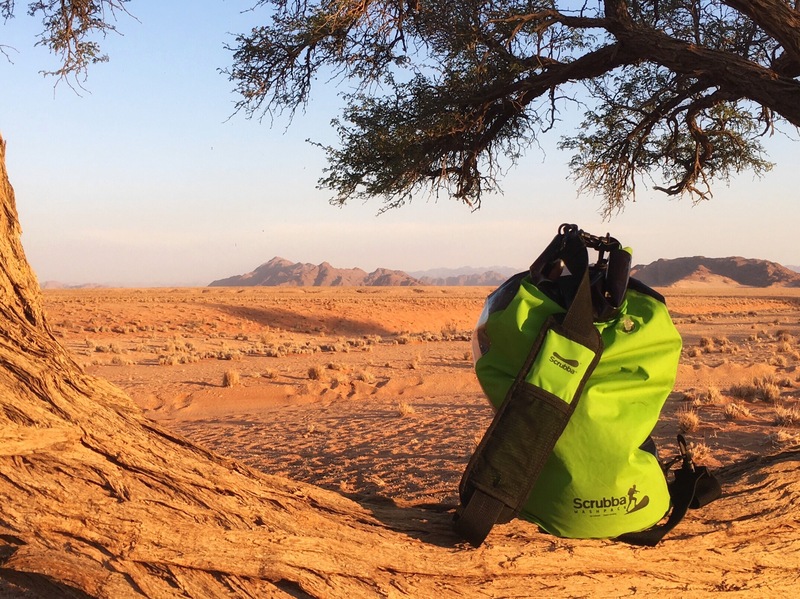 Enter the Scrubba WashPack…it’s a 3-in-1 Portable Washing Machine, Dry Bag, and Day Pack problem-solver. So, no, I’m not lugging around a noisy, electricity gobbling, clunky piece of hardware. 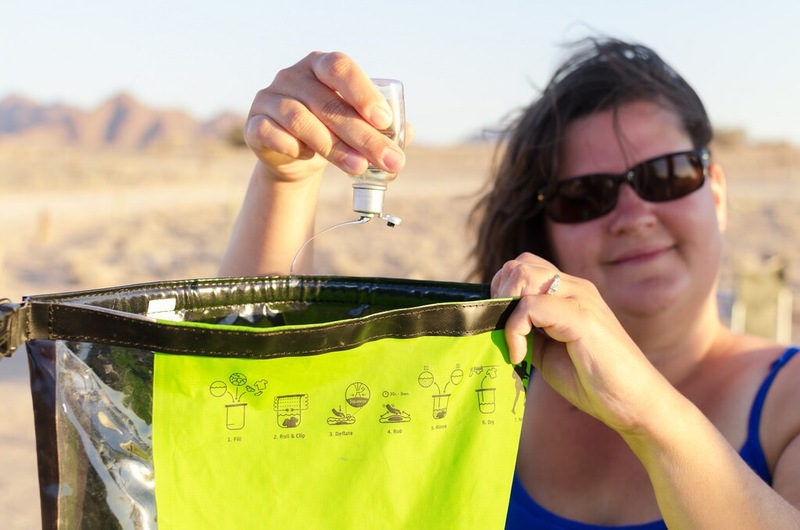 This nifty little gadget doesn’t need to be plugged in or hooked up to any water source, and it folds up neatly to about the size of my hand (even comes in its own re-usable packing cube!). So, it is indeed, quite portable. What it is, is basically a watertight fabric bag with a rubberized back (to reduce slipping), with an internal plastic washboard of nubby bits that you rub your clothes against to get them clean. Toss your dirty clothes into the bag (I found it did best with a small load of 1-2 shirts, and 2 pairs each of undies and socks. ), add just enough water (from a tap, a bottle, or even a river) to cover the clothes, and a squirt or two of soap (shower gel or shampoo works fine, or get fancy with proper eco-friendly laundry detergent). Squish out as much air as you can before closing and rolling the top down about 4 times before clipping shut, then open and squeeze the valve to get rid of the remaining air. You want no air in the way of rubbing your clothes against the washboard. This is the fun part. Make up a song and start scrubbing your clothes in time to the beat. I liked the original Super Mario underground theme music. Imagine it in your head with me. Reposition clothes in the bag to get the best washboard action. Repeat as needed (generally 30 seconds to 3 minutes). It’s like kneading bread and gives you a similar workout. Open it up and dump out the dirty water. If you’ve used eco-friendly soap, this can be almost anywhere. 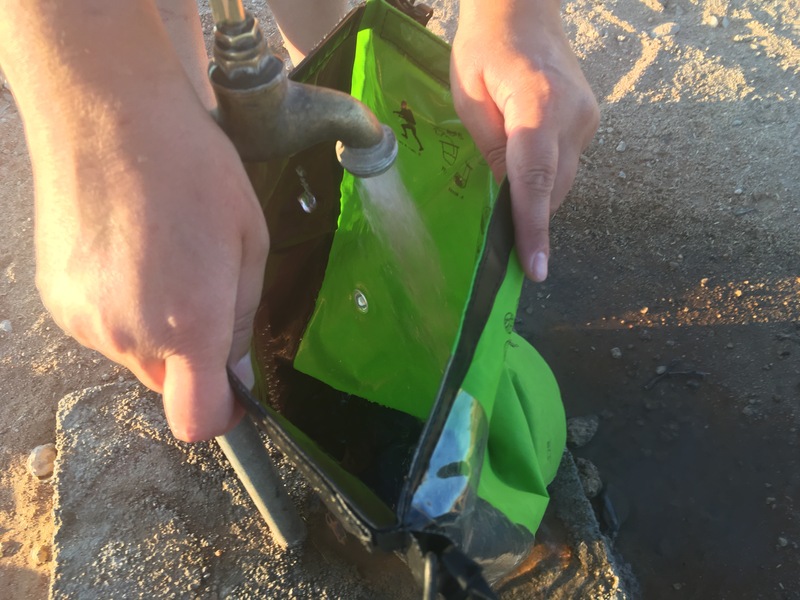 Then add enough new water to cover your clothes, close up the bag (with lots of air in, this time), and get ready for the fun part. I alternated between Harry Belafonte’s Jump in the Line (Beetlejuice got me before Pitbull brought this one back), and KC and the Sunshine Band’s Shake Your Booty, for this step. 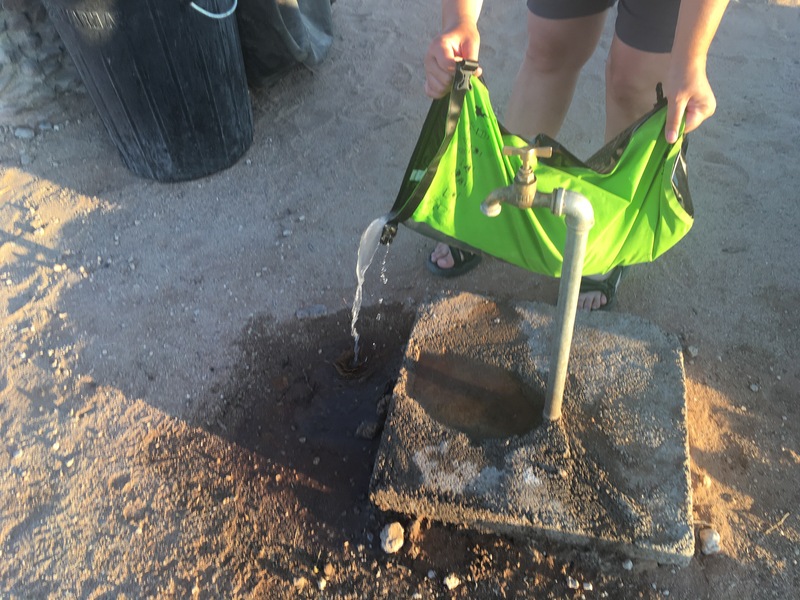 The point is to shake your clothes around in the clean water to rinse any remaining soap out of them, but you might as well have fun doing it! Pour out the rinse water, squeeze out the excess water from your clothes (try rolling them up in a clean towel before twisting it), and hang ’em up to dry. The Scrubba can then be turned inside out and hung from its clips to dry, too. 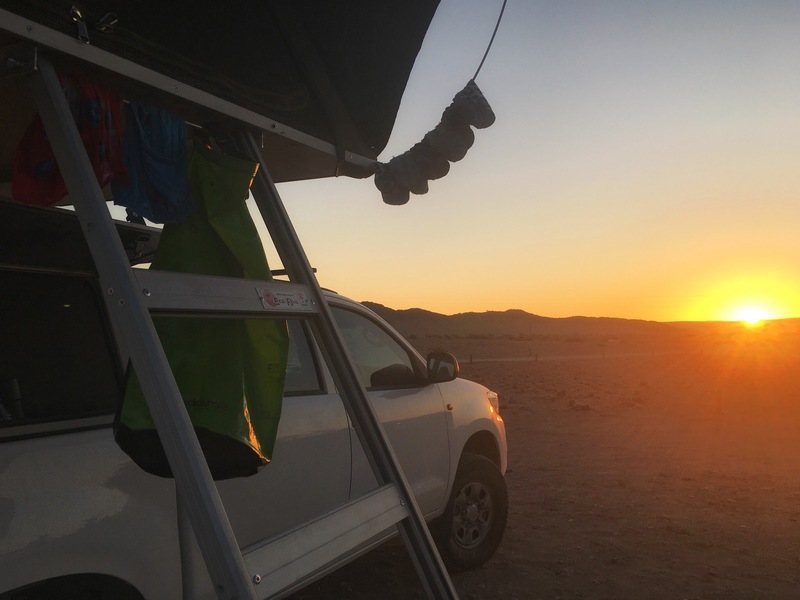 Pro tip: I used the backpack straps of the Scrubba to fashion myself a clothesline strung between my tent poles. -It works better than a traditional washing machine in that your clothes aren’t just getting swished around or mangled on an agitator, but you control how much actual scrubbing they get. -You don’t need to struggle to wash your clothes in the hotel sink with no plug stopper while avoiding your travel partner’s toothpaste blobs. -You don’t need a sink at all! 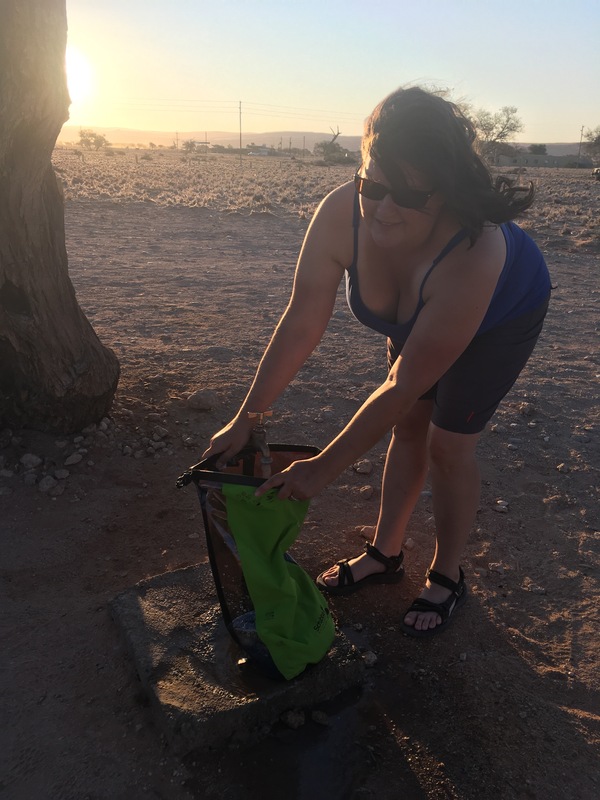 I did laundry in the middle of a desert while camping. -You avoid prune hands and touching the gross and/or soapy things too much. -Extremely easy and portable. Weighs only 300 grams and folds up small. -Never have to worry about sending laundry out again! -Wash as little, or as much, as you need to. -Great for camping, and travel, and perfect for home when you’ve been gone for almost 3 weeks, and realise your work shirt has been buried under a huge pile of stinky laundry the whole time, and it’s too late, according to condo rules, to throw a load in the machine, and you have to be at work early the next morning! -Have to be careful not to puncture it. Just watch out for zippers, etc inside it, and abrasive surfaces you are washing on (but it is repairable). Perhaps, my favourite aspect of the Scrubba is that when I’m not using it to wash my clothes, I can use it to protect my gear from the elements. It is waterproof (within limits, water can wick through the opening after about 20 minutes or so). Great for rain and snow, and I would take it snorkeling with my towel inside it, but I’m not so sure I’d dunk it with my camera inside. 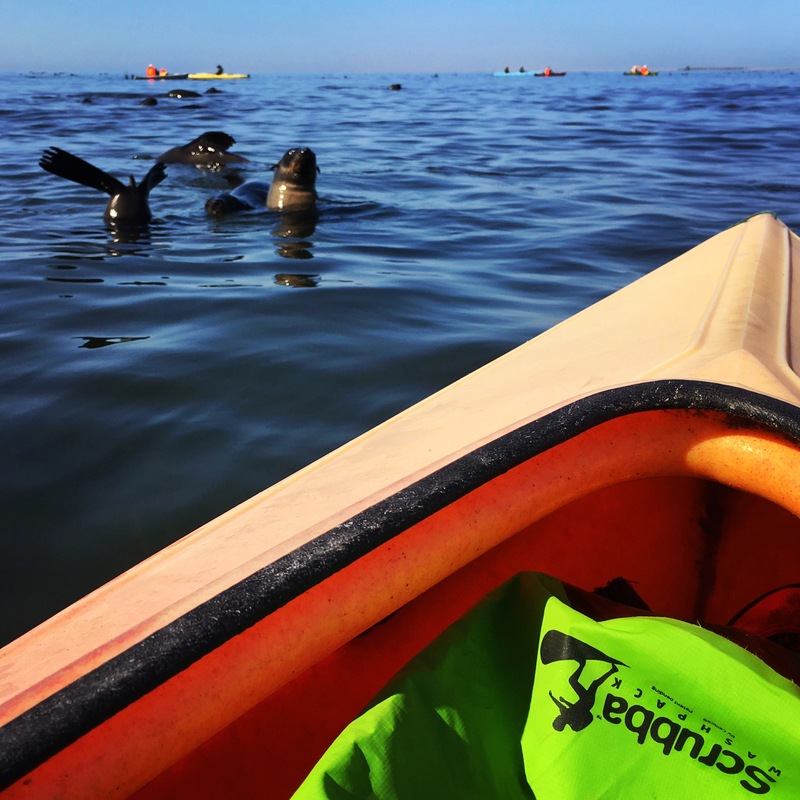 I used it to protect my camera from seal splashes, and I’m sure glad I did, because one of the playful little buggers totally soaked me and everything else in my kayak, but my camera stayed safe! 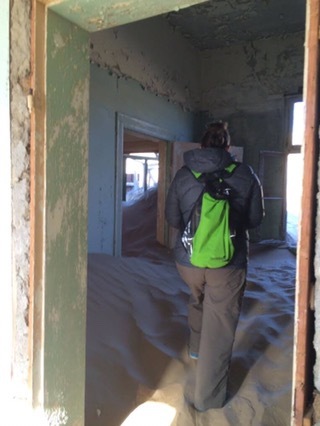 I used it on the dunes, strapped onto my ATV, when the wind was whipping sand into my teeth, my camera never got gritty. 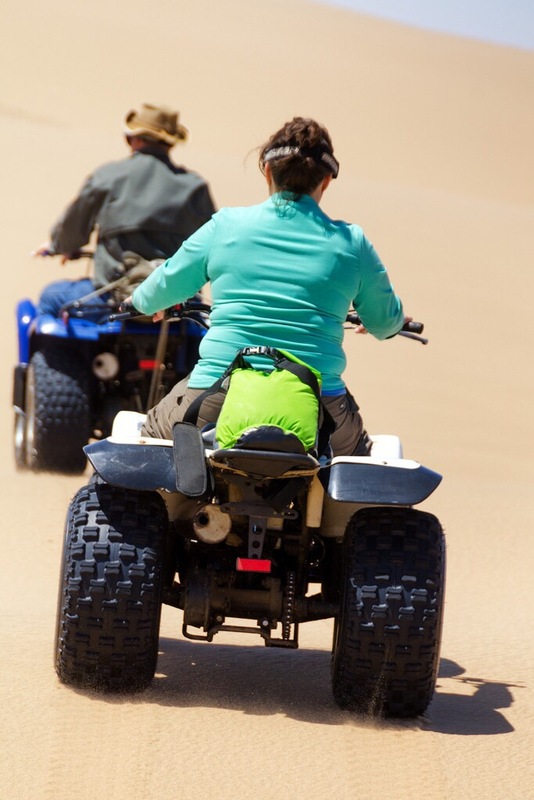 -Protects from weather, dust, sand, and insects. -Have to make sure it is closed properly. 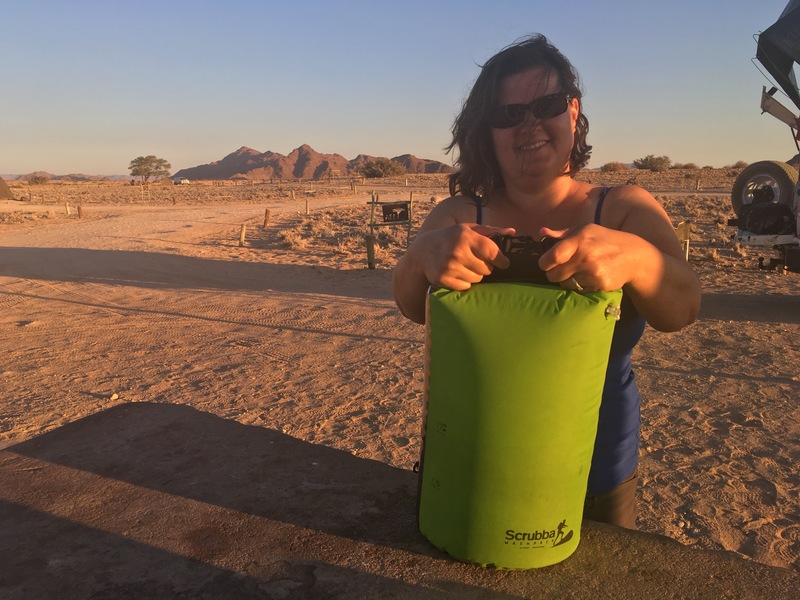 The Scrubba Washpack comes with two straps so that you can clip them on, and wear the bag as either a backpack, or sling it messenger style. The straps have removable wide padding with a secret pocket for some cards or a small phone. 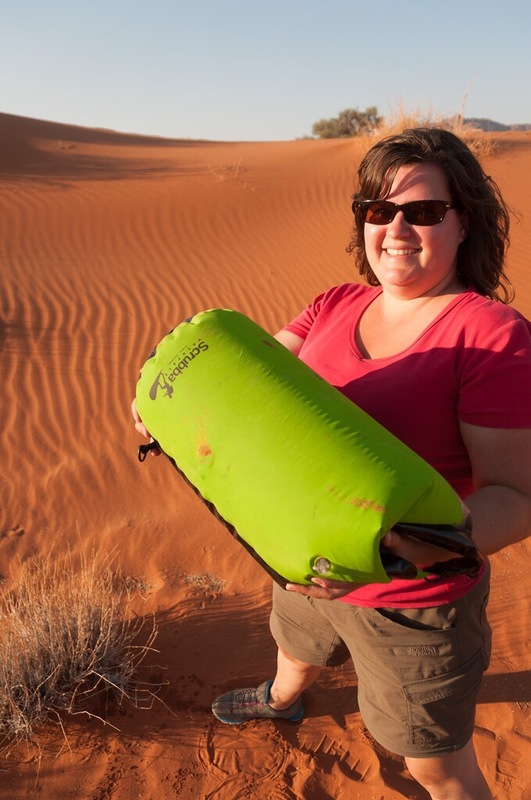 It makes the bag more useful than just being a straight-up dry bag. I think this will be my go-to bag when I’m going for a hike in questionable weather or heading to the beach. 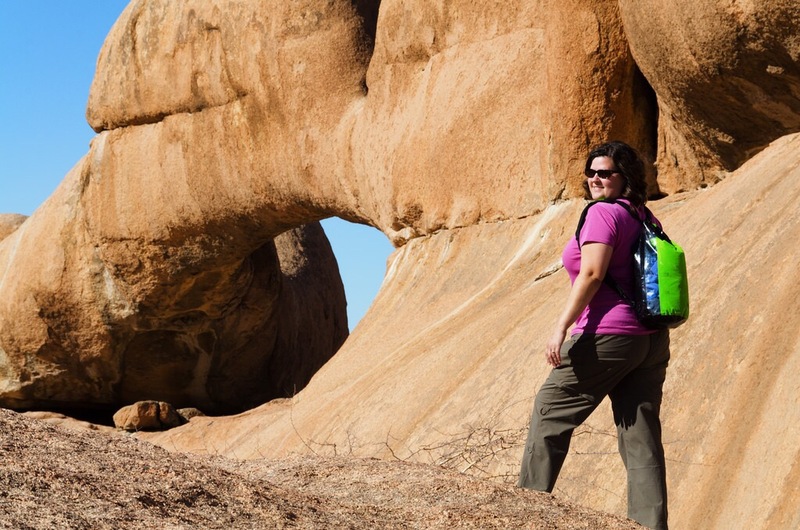 I hate carrying things and don’t enjoy tying my extra layers around my waist, so this bag is the perfect solution to carry my extra stuff and protect it from the elements. It is just the right size for my jacket or towel, a water bottle and an extra camera lens. -Can take it with you everywhere you go. Even underwater! -It’s bright green, so it’s easy to spot. -Could do with a chest strap so you can really go hands-free. 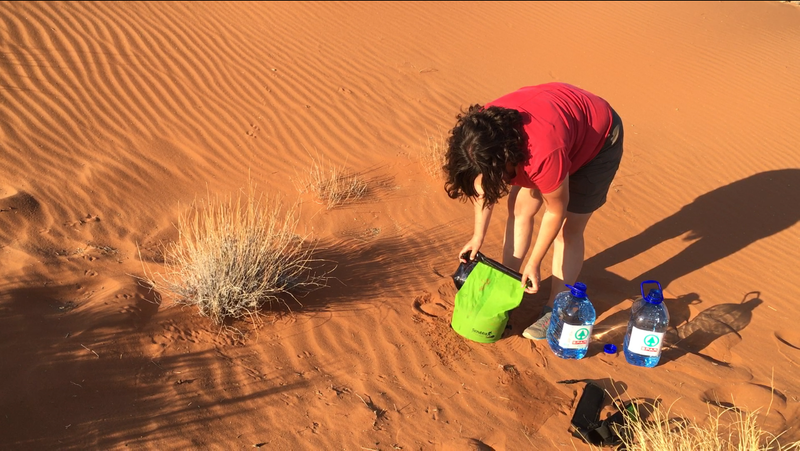 -Can only hold 13 litres worth of stuff, and you have to be careful that your stuff won’t puncture it. Somewhere along the way, I got a tiny little hole in mine, but it came with a patch, so I will be repairing it before my next trip. 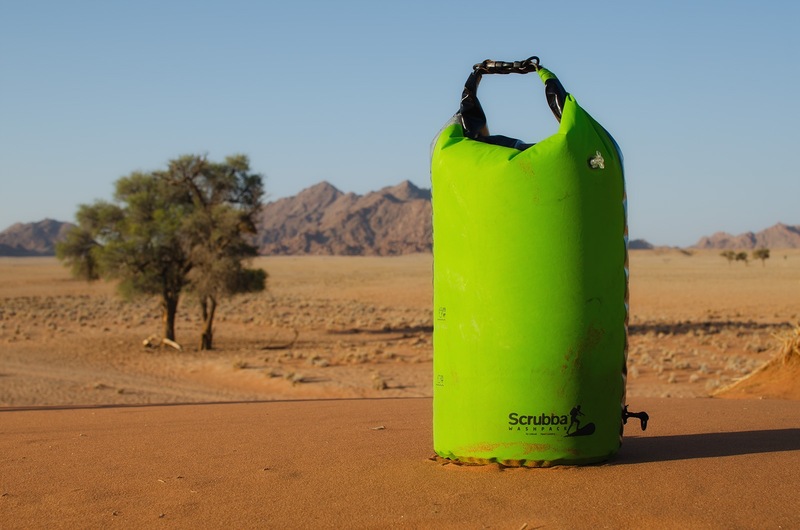 The Scrubba bag, alone, would be a handy thing to have on longer trips, when you need clean clothes at some point. On shorter trips, when you really want to pack light. Or dirty trips, when you know you’re going to get mucky and want to take care of the mess right away. Or any trip, if you are prone to spills/not looking before you sit/interacting with wildlife and might need to tidy up. It’s safer, cheaper (pays for itself within just a few hotel laundry days), environmentally friendlier, and more convenient than sending your laundry out, or trying to wash by hand. Now add the dry bag protection abilities and backpack functionality and I say that this item will probably come with me on almost all my future travels. Scrubba kindly provided me with a sample Washpack to review, but all opinions are my own and unprompted. WHAT IS THIS?! Oh my goodness, I never thought such a thing would exist, but it makes so much sense. I actually own a “semi-automatic” washing machine that kinda works like this (the only mechanical part is that it spins for you and can drain from a spout). So having one you can walk around with is pretty nifty. I don’t think I’m ever traveling so long that I can’t pack my clothes in a backpack, but so far I haven’t done more than like 2.5 weeks. I will keep this in mind! With this thing, you can pack so few clothes you can go carry-on only. my sister saw this a few years ago and got it for my dad as a christmas gift because he loves to travel light and camp! i’m not sure if he ever used it or not but it was definitely a GREAT gift idea for someone who likes to go on long trips with very little luggage! I have never heard about anything like that! This is really useful – thank you so much for sharing! No problem! I really love this thing! I’ve been seeing these advertised online and have been wondering if they actually are as good as they seem so this was really really interesting. I just had my clothes destroyed by a lady in Mexico so I would have loved to use something like this! Good to know about it being relatively easy to puncture as well – I’m a bit clumsy so that is great to know! It is made of pretty strong material, but you need to be careful of things like zippers, etc. How useful! Good, thorough review. Oh wow! This is a must have for every traveler – easy to carry, extremely useful and multifunctional. Thanks for sharing! Omg what is this thing?! Never heard about it before but it looks amazing and super practical for every wanderer out there! Thanks for sharing! That’s just it! As a wash bag, it could be useful, but it’s the 3-in-1 aspect that will earn it a place in my bag for future travels.